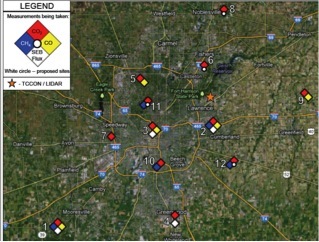 As part of NIST research efforts aimed at improving greenhouse gas measurement capabilities in cities, the Indianapolis Flux Experiment seeks to develop measurement and analysis methodologies to enable reconciliation of bottom-up and top-down emissions determinations. Improving the accuracy of both types of methodologies will support future greenhouse reduction efforts whether implemented through regulatory or market-based approaches. INFLUX is a partnership funded by NIST. Participants include NIST, Pennsylvania State University, Purdue University, the University of Colorado, NOAA and private sector partners. The first phase of INFLUX, underway since 2010, explores how accurately carbon dioxide emitted from a small city can be measured with top-down and bottom-up approaches. Researchers are collecting the top-down (or atmospheric monitoring) measurements from aircraft and tower-based instruments. On the bottom-up (tallied from fuel consumption information) side, researchers are collecting and evaluating fossil fuel data from a variety of sources including EPA inventories. In phase two of INFLUX, scientists are developing a dense surface-observing and analysis approach and evaluating its performance. INFLUX is funded by NIST and led by Pennsylvania State University. Click on the logo graphic to visit the Penn State site.